mauilibrarian2 in Olinda: Admiring Ms. Davis' New iPad! Admiring Ms. Davis' New iPad! Sixth grade math teacher Ms. Davis brought her brand new iPad to our Tech Staff meeting today! She's keenly interested in learning how the device can be used in the classroom, not only for math, but for other subjects too. She already went to the Apple App Store and downloaded some apps, many of them free. Ms. Davis thought I would enjoy this slot machine probability app. The manual for the iPad is totally online. Each purchasable app ranges from $1.99 to $4.99. Larger apps like Pages and Notes are available for $9.99. The iPad can be connected to a projector, using a purchasable cable, and can also be used with a wireless keyboard. The battery charge for an iPad lasts for 8 hours. You can read Kindle books on it. If you have a MobileMe account you can find a misplaced iPad, using GPS capabilities. The device has a hard drive in the form of flash memory on a chip. And my personal favorite, the video resolution is SPECTACULAR. This is what the keyboard looks like. Ms. Davis envisions a learning environment where every student has their own iPad, kept in the classroom. Mrs. Hodara notes: "The iPad and other new mobile technologies are transforming how we communicate with each other and share our knowledge. They would also be great tools for classroom use." Mr. Turbeville reflects: "It looks great, seems easy to use and has a ‘wow’ factor that everyone likes. I think this type of technology is great if we can determine the proper use for it in the classroom, it makes the teacher’s job easier, and the students are excited to use it. I was pleasantly surprised by its weight and video resolution, and I can see many professional (and fun) uses for it. 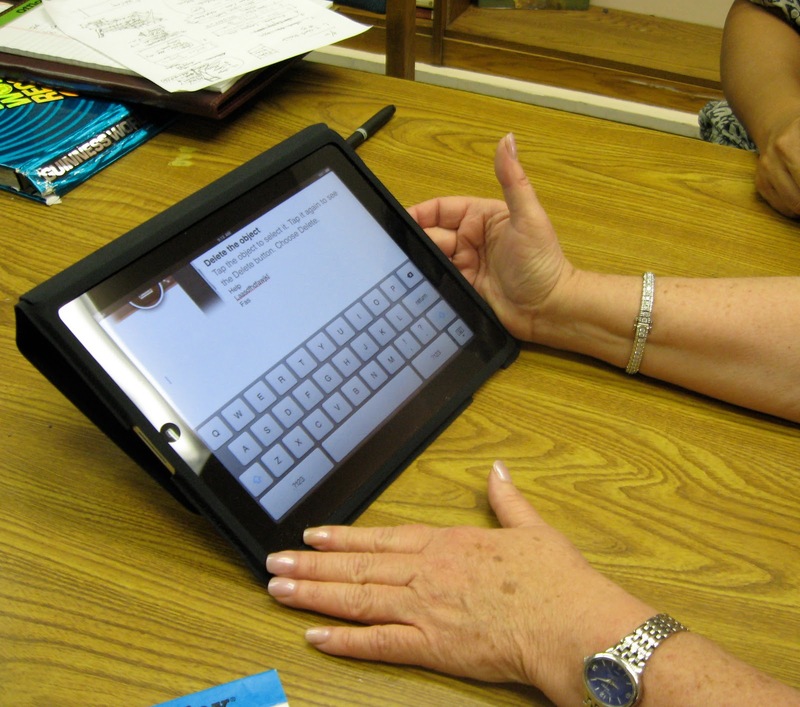 I know of at least two students who already have an iPad in the Upper School." Mr. Toda's reaction: "It’s an exciting new technology. It’s not a replacement for a desktop or laptop computer but really in its own category. We are only beginning to discover its potential in the classroom and for educational purposes. If you have one, please share your favorite apps!" Ms. Davis loves her iPad. 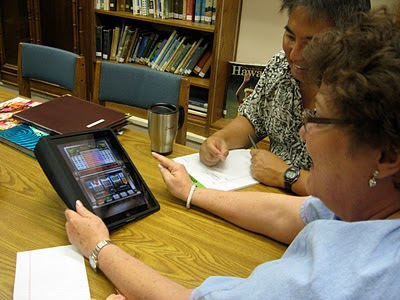 "This is the students' world, and I think they would enjoy educational activities with the iPad. It is a lot of fun to work with and I am looking forward to all the new apps. I try to learn about new things that students can relate to -- the iPad is neat-o-keen! 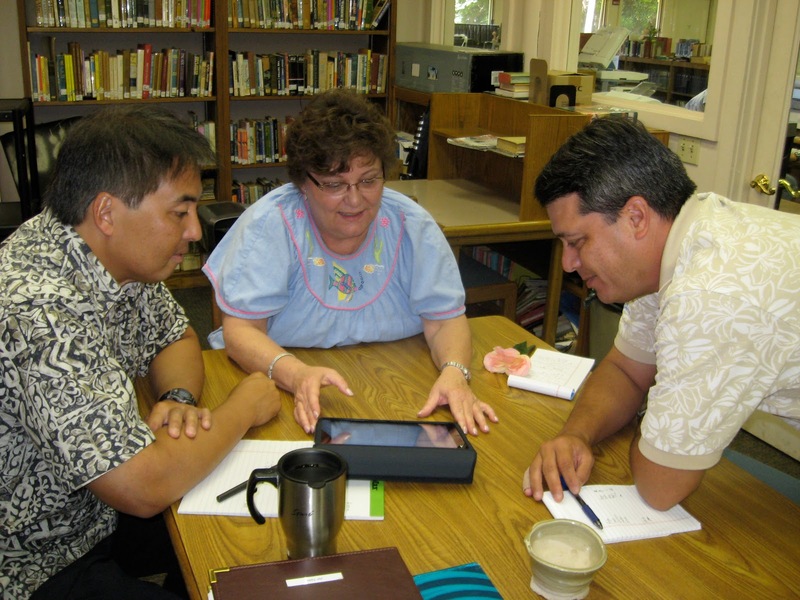 (one of Ms. Davis' favorite words)"
Looks like we'll be experimenting with iPads in our Seabury classrooms, come Fall!